Great packing & identification tape. Use for bag locking, marking, color coding & labeling. Can be perforated for individual labels. 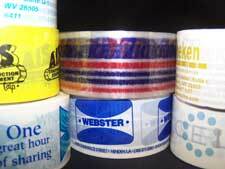 Sizes: All paper tapes come in 60 yard rolls in the following widths: 1/4", 3/8", 1/2", 3/4", 1", 1-1/2", 2", 2-1/2", 3", 4", 5", and 6". Colors: White, red, orange, yellow, green, and blue. High performance with low cost. 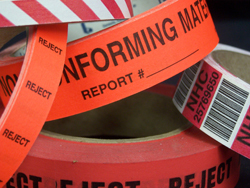 Use for color coding, marking, bundling, labeling, sealing & reinforcing applications. Excellent resistance to outdoor weathering, chemical attack & wide temperature and humidity ranges. In the following widths: 1/2", 5/8", 3/4", 1", 1-1/2" and 2". Colors: White, tan, red, orange, yellow, green and blue. No need for costly pre-printed cartons. Excellent general purpose packaging tape. 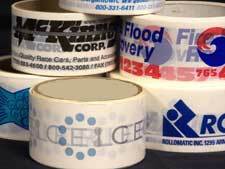 Tough, waterproof 1.9 mil to 3.0 mil polypropylene tape. Reduces pilferage because tampering is more evident. Get your message across while sealing your packages.